At a Paul McCartney concert over a decade ago which I was a, he did 33 songs in a show divided into two sets. Three were new songs, and the rest were taken from a career that spanned the Beatles, Wings, and his solo work. Every song was not just a hit, but an all absolute, world beating classic, The audience, mixed from 70 year olds to grammar school kids, grey-haired grandparents to punks with colored Mohawks, all sang along to virtually every song. It was incredible, Not just the cross generational passion, but the fact that here were 30 classics written by one man (some with John Lennon). And then I sarted thinking of all the songs he didn't do. For many years I spent so much time defending McCartney to my "Lennon was the Beatles" friends that I planned to write a book on the topic. As my friend, and music expert, Ward Dotson (Gun Club, Pontiac Brothers, Liquor Giants) says: Macca is the all time greatest band member - he plays every instrument better then anyone else, he writes incredible songs, he's enthusiastic, experimental and creative, and when he opens his mouth he naturally sings the most perfect harmony. Every time. The world has caught up, and few consider the Beatles a one man show anymore. But I still think people won't truly appreciate McCartney's genius until he's gone and they start listening to all the post Beatle records he's released that passed them by,, and realize what an incomparable body of work in pop music he owns. So here, are my 40 best McCartney Post-Beatles songs. It's a subjective and fluid, list, might change tomorrow. Everyone will have their own 40, so please let me know in the comments which ones I missed, which I should have omitted..
McCartney II was a purely solo affair, revisiting the template Paul used on his first solo record. The song started with drum tracks recorded at his farm in Scotland, adding other tracks as he built it into the final song. A fairly straight up piece of work on an otherwise experimental record, it was never a great favorite of mine, but over the years its charm revealed itself. It's also been said that it was in part the inspiration for Lennon to record his comeback record, Starting Over. And the video is nothing short of inventive. After a year of grieving, Run Devil Run marked the first McCartney solo record after Linda's death in 1998. For this record he assembled arguably the best band he's had post Beatles: David Gilmour (Pink Floyd) on guitar, Ian Paice (Deep Purple) on drums, Pete "Wix" Wingfield (as well as the great Gearing Wilkins) on keys. His main ringer was one of the all time great guitar players, Mick Green (Johnny Kidd & the Pirates, Billy J. Kramer & the Dakotas) whom Paul had known since the Cavern days. When he told Elvis Costello, a shrewd assessor of musical talent, who was in the line up, Costello replied: "Not THE Mick Green??" Paul came into the studio each day with a song, the band played through it one or two times, then recorded it. The album consisted of mostly covers, known and obscure, that had meant a lot to McCartney in his formative years, as well as three new originals. One of the originals was this Fats Domino pastiche which pays handsome tribute to one of Paul's biggest influences. Its not hard to imagine who it was he was thinking of when singing. This bright instrumental dates back to 1958, and appeared in sets by the Quarrymen, John's band which Paul joined. The Beatles even took a stab at it during the Let It Be sessions. 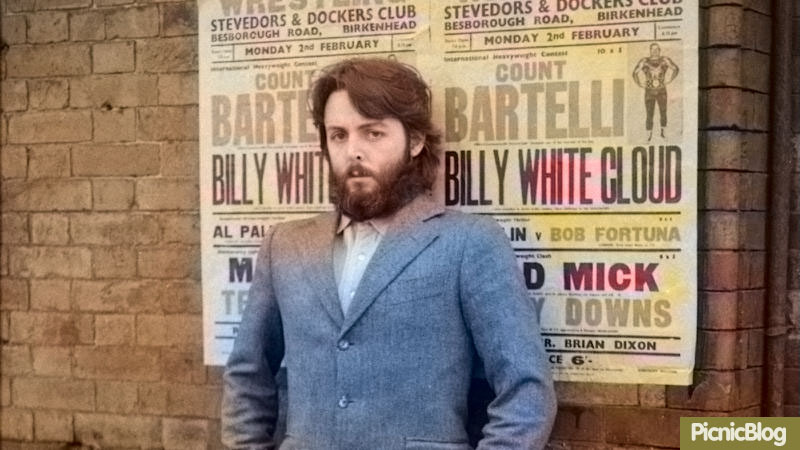 It made its true recorded debut on the first solo record, which was a product of Linda's prodding that he deal with his depression over the Beatles break up by putting his energy into a new project. Tinkering with old songs, and experimenting with new ideas, Paul played all the instruments in his little home studio in Scotland. When it came out people either loved the album, or hated it. Its reputation has gained a lot of ground since then. This track is a perfect McCartney melange of melodies, with a short bit of random glass playing at the end. On the album its followed by a fragment of a song called Suicide, which Paul wrote for Frank Sinatra. Apparently Frank didn't think the topic was his bag. Most songwriters will tell you every instrument has different songs in it. Different guitars produce different songs for me, keyboards takes me in a completely different direction. Dance Tonight was the last song recorded for Memory Almost Full, and it was the generous gift of his new mandolin, and his young daughter Beatrice's constant dancing whenever he played it.. Simple and spry, its infectious melody is hard to shake, and its pure spirit is a great tonic. The video happily features Natalie Portman. 50 years into his recording career, McCartney released his 16th solo record and proved that not only could the old dog learn new tricks, at 71 he can still play the older ones better then anyone else. This track, produced by Mark Ronson (Amy Winehouse), and featuring his current, excellent band, is a perfect bit of mid-period Beatles, evoking the jaunty keyboard joy of Penny Lane. It bears the trademark optimism of young love, not surprising since he was out of a bad marriage, and headed into a very good one with new wife Nancy Shevell. Early Days is one of several songs on New with roots in the past. The day he wrote it Paul said he was thinking of John, specifically vivid images of them listening to records at a record store when they were kids, as well as writing songs together. The lyric is one of his better efforts, defiantly clinging to the truth of the Beatles which he knows best because "I lived through those early days". Fingerpicking on the guitar, his voice showing a bit of the raggedness of age, its emotional resonance packs a punch. It was produced by Ethan Johns, son of legendary producer Glyn Johns, who was the original engineer on Let It Be. The Beatles set the template in most ways for what a band was, which is now a universal theme that's well reflected in the Mississippi Delta located video. What started as a folky demo, written while vacationing the US, took a heavier tone once McCartney got into the studio with ELO frontman Jeff Lynne, who also worked on the Beatles Anthology and with George Harrison in super group Traveling Wilburys. The two played all the instruments here, with Paul laying down the drums. The song's brooding nature belies the fact that its writer says he had no specific meaning in mind. To say 1986's Press To Play was a commercial and artistic disappointment would be an understatement. Many thought McCartney was coasting on his Beatles legend, and it seems the Cute One got the message. Flowers In the Dirt was a great return to form. Knowing he was planning a big tour in support, he put together a tight band featuring Robbie McIntosh (Pretenders) and Hamish Stuart (Average White Band) on guitars, and Paul "Wix" Wickens on keys, who remains with the band to this day. But his biggest adjustment was teaming with Elvis Costello for several songs, a fruitful if not altogether harmonious collaboration. The jaunty, melodic track has a Beatles vibe brought by the only person who can do it right, while Costello's influence on the lyrics has an obvious Lennon quality. The chorus hook is a killer, and we have Costello to thank for getting Paul to bring his Hofner bass out of retirement. You can easily find the album version, but here's Paul and EC's demo. Hi Hi Hi has the dubious honor of being the second McCartney single of 1972 to be banned in the UK. The naughty Give Ireland Back to the Irish was first. The BBC misheard the lyric "get ready for my polygon" as "get ready for my body gun" and ditched it for sexual content. Paul likely should have gone with the BBC's more interesting lyric. He likely wasn't appreciating the song's chorus content while in a Japanese jail for bringing a large stash of marijuana into the country in 1980. The tight rocker is pure McCartney who has a penchant, and talent, for little shredders like this. Helen Wheels, ecorded in 1973 for Band On the Run, is the perfect companion piece. It's also minus controversy as the title refers to the Range Rover Paul and Linda had in Scotland. Oh Woman Oh Why debuted as the B-side of Paul's first single, Another Day, offering quite a contrast to the A-side. A churning blues rocker, it features one of Macca's best vocals, covering a wide swath of territory. Someone once referred to his vocal capabilities as "gymnastic", and you can hear that here. A signature ingredient of the Wings records was Linda's backing vocals, which make a brash debut on this track. While it was an obvious highlight of early Wings' shows, I'm still confused by the gunshots, and who did the shooting. In the 1990s McCartney formed the experimental, and anonymous, band Fireman with producer, and former Killing Joke bassist, Youth. While much of their output was truly experimental, this song off the third record is well inside the Macca wheelhouse. The rising vocal harmonies lift behind the static melody line, sung in Paul's upper register - tension and release at the same time. It's a deceptive song that worms through your ear, and into your brain, where it refuses to give up residence. Childlike wonder, indeed. Jack White's excellent PBS series American Epic beautifully captures the meandering river of influence that is music, and it concludes its episode on country music by showing how far the tree based on the roots of the Carter family, originators of country music, stretches. Troubador songwriter Donovan Leitch learned the clawhammer fingerpicking style from none other then Maybelle Carter, matriarch of that legendary family, while in the US. Then during a six week stay in India, studying transcendental mediation from the Maharishi with the Beatles, he passed the gift on. John asked him to show him how to play it, and out of that session came Dear Prudence. Paul was also in the room and his alert ears captured not only the fingerpicking style, but the descending minor chord structure, which together birthed Blackbird. Teaming with Radiohead producer Nigel Goodrich on the album Chaos and Creation in the Backyard at George Martin's suggestion, was a stroke of genius. Goodrich was an active producer who challenged the legend and brought out one of his best records. Jenny Wren, based on a character of the same name from the Dickens book Our Mutual Friend, found Paul returning to that fingerpicking style. In fact, he's referred to the song as Blackbird's sibiling. Though he tells a different story of its origin here, its a beautiful piece with a melody that floats on air, rising and hanging before dropping back down. McCartney took two years off from recording during the Beatles Anthology production, and when he came back he was loaded with Beatles inspired songs. He wanted to get back to the "simple and complete" nature of the early Lennon-McCartney tunes, setting a limit of four hours recording per song to record. For this title track he used as lyrical inspiration the oft repeated Beatles origin story Lennon created off the top of his head. It's based on a boogie woogie piano roll, inspired in parts by Fats Domino and Humphrey Lyttelton's 1956 jazz record, Bad Penny Blues. It's the same formula that gave life to Lady Madonna and later to What It Is. Jeff Lynne produced, and with Macca the two played all the instruments. The record also features engineer Geoff Emerick, responsible for so many of the Beatles greatest sounds, and along with George Martin, Paul's most important production partner over the course of his career. The song's power is undeniable, and it remains a live staple for Paul to this day. John Lennon was passionate about writing songs with real feelings, personal events, and he regularly dissed Paul's style of often writing about fictional people. Another Day, the first song recorded during the Ram sessions (and the first McCartney single), was such a song, and John famously ridiculed it in his How Do You Sleep. But each songwriter has his style, and McCartney's works as well for him as Lennon's did for him. This perfect bit of Macca confection floats on air, the lyric observationally capturing a regular day in the life of its protagonist. Written and first played during the Let It Be sessions in 1969, the recording is Paul's beginning attempt at creating a unique sound, separate from the Beatles, for his songs, To that end, the Paul and Linda's harmonies, a key ingredient of the Wings era, are prominent, and the song does not sound like a Beatles song. Another Day is credited to Mr. and Mrs. McCartney, thereby keeping 50% of the songwriting royalties which otherwise would have gone to Lew Grade's ATV who had recently acquired controlling interest in Northern Songs, owner of Paul and John's songs. My Love is a wonderful McCartney song, another in a seemingly endless chain of perfect melodies, a decent lyric written for Linda, and it was a big hit. But for me, what puts My Love on this list, is the guitar solo played by Irish guitarist Henry McCullough. Not one of the better known guitarists in non-musician circles, Henry is certainly one of the best to ever play on record. Before and after Wings he had very rich career (Spooky Tooth, Joe Cocker and the Grease Band). When it came time to record the solo for My Love, Paul as usual explained to him what he wanted him to play. At this moment Henry reached a turning point on playing something he thought was subpar, and said so. He wanted to play his own part. When Paul asked what he wanted to play, Henry replied he didn't know. To say there was tension would be an understatement. So playing with a live orchestra on the dime, Paul and George Martin in the control booth, he made up this solo on the spot, and created magic. McCartney respected him for standing up for what he believed, and even more so for lifting a good song to greatness. A standout track from the Nigel Goodrich produced Chaos and Creation, this song started with the duality of the opening stanza - the fine line between recklessness and courage - and the need to choose which approach you will take. But at its core, Fine Line is a classic McCartney pop melody over churning piano, a combination that has created many a classic. Paul and Linda were lovers of bucolic countryside, and they spent a lot of time on the farm in Scotland. While in Nashville with Wings in 1974 they stayed in Lebanon, TN, outside of Nashville, on the farm country songwriter Curly Putman, Jr., who is best know for the George Jones classic He Stopped Loving Her Today as well as Green Green Grass of Home. They rode horses, practiced with the band in a barn Putman had set up as a rehearsal space for them, and relaxed. Written as a tribute to Curly's farm, the single they created here of course reflected the country setting. Well, no. Junior's Farm is a rocker that could have felt quite comfortable on Band On the Run, and whose lyric don't seem to have anything to do with Curly. The great lead guitar was provided by Jimmy McCullough, the Scottish guitar player from Thunderclap Newman (Something In the Air) who was making his Wings debut on this single. Opening with the words "Piss off, cake", Too Many People fires directly on its intended target - former mate John Lennon. The Beatles demise was a vitriolic, operatic mess, leaving plenty of anger and hurt feelings in its wake. This song consists of a series of digs at Paul's former songwriting partner ("Too many people preaching practices", "You took your lucky break and broke it in two"), but it did so in the context of a great rock songs. Ram is without question my favorite McCartney record. Like many of his other early records it was callously dismissed upon release, but now in hindsight can be seen as the template for the indie pop movement. This song features excellent session guitarist Hugh McCracken who not only played on the first Left Banke single, and Laura Nero's Eli and the Thirteenth Confession, among others, but came back around to play on the final John Lennon album, Starting Over. Back to Lennon, this song ignited one of many sniping wars between the former Beatles. Lennon's How Do You Sleep? was a direct response, as was the postcard included in early copies of Imagine which featured Lennon mockingly holding a pig by the head. It's hard not to think of Lennon's Plastic Ono Band when you hear Let Me Roll it. The tape echo alone is usually more a figure of John's early work then Paul's. It also features a super heavy bass, and piercing guitar riff, which were both evident on Lennon's album, as well as Cold Turkey. But McCartney insists the similarity is coincidental. The title comes by way of another Beatle, George Harrison, who featured the refrain as a line in the song I'd Have You Anytime on his debut record, All Things Must Pass. One of Macca's rawer recordings, the song closed out side one of that bounty of musical pleasure, Band On the Run, and has been a live favorite throughout Paul's solo career. If you haven't heard it, seek out the Tedeschi Trucks Band cover of this song. Beginning with a mellotron leading to an acoustic intro, Beware My Love suddenly begins to build into a broiler rocker. The keyboard motif reminds me of a Motown song, and Macca's bass is crisp and out front, much as it is across the entire record. It's the best, and only, real rocker on one of Wings more popular records. McCartney has suffered from expectations that don't take into account his intentions. He's not going to make a John Lennon record, and any sane fan wouldn't want him to - that's not his forte. Memory Almost Full, which followed the acclaimed Chaos and Creation, is one of his better solo records, though it didn't get the acclaim on release. The album finds him looking back in style, and lyric, to older days, as the title suggests. That Was Me moves on a solid yet slippery groove, with a killer baseline, and some sweet drums by Abe Loboriel, Jr, from Paul's long time touring band. Lyrically the song looks back at the writer's life in astonishment. More then any other Beatle, Macca seemed to understand from early on what a precious thing they'd created. Reflected in his rear view mirror, I guess its hard to realize you're "that" Paul McCartney. "That was me ... the same me that stands here now. When I think that all this stuff can make a life, that's pretty hard to take it in". In the beginning, as is often his case, McCartney had just an opening line - "No one ever left alive in nineteen hundred and eighty-five". The song's insistent piano pounds out the chords, rhythm accentuated by maracas, while a swirling mellotron creates a sonic storm as counterpoint. Then it releases into a classically sweet Wings vocal with Paul, Linda and Denny Laine breaking up the drive with a short stop for sightseeing. One of McCartney's better solo vocals. Until Band On the Run Paul found mostly ridicule - from his ex-bandmates, the critics, some ex-friends - and he has acknowledged hitting a depression severe enough that he was heavily self-medicating with alcohol and weed after the Beatles break up. Smile Away is the trademark McCartney positivity, finding an upside through the upside down. Level-headed and grounded, Linda was his main elixir on this journey back to balance. I've always heard the backing vocal refrain (probably wrongly) as "She taught me how to do that", which fits my theory well. Another gem from a record chock full of them, this rocker hearkens back to the 50s in style and simplicity, a reminder that complicated is great, but not necessary. McCartney's entry into recordings of standards is not like the others. There is no reverent hush, nor the sound of someone trying to prove his ability to emote. The record has a relaxed feel that seems to gibe well with the artists personality. For those who take the time to give this record a listen, a very pleasant surprise awaits. But the biggest surprise is how easily, and well, the two McCartney originals fit in. Paul regularly refers to himself as a craftsman, and the truth of that shows on this genre exercise. Written on a rainy day in Morocco where he and wife Nancy were on vacation, the minor key captures the grey day, the lazy melody reflects the mood. He gets some help on the recording from big talent, Diane Krall and Eric Clapton, among them. And Natalie Portman returns (with Johnny Depp) for the video, which was directed by Macca. This bitter retaliation song started as an aggressive uptempo piece of work. At the time, and in hindsight, the song seems to be about his crumbling relationship with his publicity seeking wife Heather. Though Macca has denied it, it seems hard to believe otherwise. It's an example of the active producing Goodrich did, because he cut some of the lyrics he didn't like and had Paul rewrite. More importantly he slowed the song down quite a lot which altered the mood dramatically. The sighing, groaning strings accentuate the songs riling mood. It's a shame the two didn't make another record together, it was a fruitful partnership. This is about as perfect a piece of infectious pop candy as you can get from McCartney. A lyric that supports his belief in sticking to what mattes in life - love - with some possible advice to heed the words of the big man upstairs. Then again, the "man" may just be George Martin in the control booth. Traffic's Dave Mason contributed some sweet toned guitar overdubs, with jazz great Tom Scott added the saxophone that pulls it all together. Thank you to Chris Carter and his Breakfast With the Beatles for many things, but most of all for the tracks, alternative takes, that I've discovered in my car on a Sunday morning because of him. This is one such discovery, which I can't believe I'd never heard before. It was originally recorded during the Ram sessions in 1971, and Macca tried various overdubs over the years to get it where he wanted it. And a casual search through YouTube reveals there have been more then a few mixes of it. This is likely the best, as the song rides atop a fast Caribbean beat, Macca singing in a falsetto, with some nice electric guitar, theoretically played by Hugh McCracken. The chorus payoff is sweet and hard to let go of. Further proof that the Ram sessions were very productive. Mull of Kintyre was a bit of a commercial phenomena when it was released prior to Christmas in 1977. It quickly surpassed She Loves You as the biggest selling single in British history. The McCartney farm, High Park, where he and Linda hid out after the Beatles broke up, spent their first years with their kids, and where Macca wrote many great songs is the subject. He's described the song as a love song to the Kintyre peninsula, and the song's lovely melody, built for a singalong, burrows into your brain. How could it not be on the list? The Beatles sojourn to Rishiikesh, India, to study meditation with the Maharishi was a fertile creative period. The natural beauty of the area, coupled with the isolation from fans, press, and London's club scene, opened up creative pathways that were explored on the acoustic guitars they brought with them (and maybe the suitcases of baked beans Ringo brought). They came back with so many songs, that they easily filled a double album, and had many remaining songs that would appear n altered forms on their subsequent solo albums. Junk is one of those songs. It was first auditioned for the White Album, then Abbey Road, before finally making it onto Paul's solo debut. In fact, it made it as an instrumental (Singalong Junk) as well as this vocal version on that record. Like many of McCartney's prettiest songs (I Will), this is a simple, short song whose melody perfectly suits the found object memories of the lyric. Beatles meets Beach Boys. Teenage girls, a car, and some gorgeous harmonies speak to a Beach Boys influence. The modulating structure, from beautiful solo with piano melody, to orchestral bits, through to the rocking outro, it's pure McCartney Beatles. Another song offered to the Beatles. When you think of the many songs Harrison and McCartney offered to the Beatles, only to have them appear on solo records, its quite an embarrassment of riches. I never get tired of this song. It's so completely unhinged, that it's hard to imagine what led to its writing. But there are clues. Apparently the McCartney kids referred to milk as "monk" when they were young, and the song took a further inspiration from the also abstract story of Lieber-Stoller's Love Potion #9. The lyric, in fact, is so surrealistic that it recalls the wordplay of Lennon in his first two books more then any McCartney song. The hard, insistent vocals add to the madness of the sound, and its hard to resist screaming along when you play it loud. Try it. And if you've never seen the Screamin' Jay Hawkins version, you should - hard to imagine it wasn't written for him. One trait that marked several of McCartney's early solo efforts was a structure made up of disparate parts, somehow melded together into a great whole. In the case of Uncle Albert this is because the song itself is made up of snippets of different song the writer had been working on. It all fits seamlessly, and coupled with the sound effects applied to it, makes for a near perfect single, the type only Paul McCartney could make. And, of course, the butter wouldn't melt, so he put it in the pie. McCartney didn't write rockers like this when he was with the Beatles, its part of the new form he developed for Wings. And its part of the reason Band On the Run resonated so well. With Geoff Emerick back in the engineer seat, the song being recorded at Abbey Road after Paul, Linda and Denny Laine, returned from Band On the Run's Nigeria sessions, the sound is fantastic. The subject of the lyric is variously attributed to a black lab puppy of Paul's named Jet, to a pony he owned, and to meeting Linda's dad for the first time (the "Sgt. Major"). But the lyric hardly makes sense, and suffragette fits in no way except as an excellent sounding phonetic choice. Still. its one of the best rockers he's written post Beatles, and just might be the first power pop song, depending how you define that genre. This has become one of my favorite post-Beatle McCartney tracks. Part of McCartney's genius is his intuitive understanding of arranging. Here the insistent staccato guitar and piano, driving drum, and solid melody, are neatly arranged around sonic space. The lyric is personal with references to the Beatles, reminders of a past that has been all around the singer - while at the same time it's universal enough to be relatable to anyone. The wistful take on time ("In went by in a flash") finds resonance in his voice. Its a great vocal, his voice aged but still the same. And the melody wanders the scale like the best of McCartney songs. The whole thing feels youthful, and mellowed with age at the same time. And in the video he and his doppelgänger move much too gracefully for men of 65. The death of John Lennon obviously impacted McCartney dramatically. It's probably no coincidence that he steeled up two years later and went into the studio to create his best, and most Beatley, record in years, with George Martin producing, and Ringo appearing on drums. This song is part of the continuing conversation between John and Paul. It's a splendid lyric, heartfelt and real, sung beautifully. Paul plays it every night as a tribute to his lost mate. Well of course Paul McCartney would write one of the best James Bond themes of all time. In hindsight it seems so obvious. The afternoon after reading the Bond book the film is "based" on, he sat down and wrote the song (in an afternoon mind you!) which he called a "job" because he had to write it around a title. Helluva job to get done in an afternoon. It was recorded the next week during the Red Rose Speedway session. Its multiple parts are par for McCartney's 70s style, and with George Martin producing it gets the sheen and attention to arranging detail it deserves. The film's producers initially didn't want Wings to record it for the film, preferring someone like Shirley Bassey. But McCartney wouldn't give it to them under otherwise. It's hard to imagine all these years later that this was even an issue. Its proven to be one of his biggest hits, a showstopper live, and it was famously covered by Guns n Roses, who had a huge hit with it in their own right. It will not die. The break up of the Beatles was a crushing blow to McCartney, but the year leading up to it was no cakewalk either. When McCartney came out Paul was considered a writer of shallow lyrics, but this song completely defeats that argument. It reflects the pain he was experiencing, the unhealthy way he was dealing with it by drinking himself out of his mind, And there's the depression in not wanting to get out of bed, while time is rushing by him. The saving grace is, as it always seems for McCartney, love, here in the form of Linda, who was his savior during this period. As a love song it avoids the cliches, and delivers the essence in the simple statement "Tonight I just want to stay in and be with you." Recording in Lagos, Nigeria seemed like a good idea, Until it wasn't. First his band quit on him right before departure, leaving McCartney to record with Linda and Denny Laine. In Nigeria the studio was a cramped cell ("stuck inside these four walls"). Soon after they got there all the song demos were stolen by muggers, and Paul had to recall the lyrics from memory. Then there was the late night, threatening visit from Fela Kuta, the Nigerian music legend, who thought Paul was there to steal and profit from the local music. It's no wonder the theme of freedom and escape run like a thread through the whole thing. And its no small blessing that Macca is such a great drummer. The result is one of the biggest Wings hits, from one of their biggest and best albums. It even got a blessing from John Lennon who called it a great song, and a great album. I agree. As on anything subjective, there will be varied opinions. But I'll wager that most people familiar with McCartney's canon, if asked, would pick this great love song, dedicated to Linda, as his best. The Beatle standard is hard to match, but this gem would have fit comfortably on any of the late Beatle records, and still have been a standout track. Written after the Beatle break-up, one of the few on McCartney that was not a leftover from earlier, it is based around the piano, Starting soft and building to a powerful midsection, its a powerful piece from beginning to end. And it must be one of Paul's best vocals, strong, soft, sweet, and hard, all things. Nearly 50 years later it is still the defining song of his solo career. So there's my 40. What's yours? Comment below the Spotify playlist.